Rory McIlroy has set his sights on taking on world No 1 Tiger Woods. Just three years ago, McIlroy watched Woods play an exhibition at Jumeirah before missing the cut in the Dubai Desert Classic as an amateur. Now the teenager, 19, is sponsored by the hotel giants and ranked 16th in the world thanks to his win in the 20th edition of the desert event. And after succeeding Woods as champion at the Emirates he's keen to get his game to a level where he can take on the 14-time major winner on a regular basis. 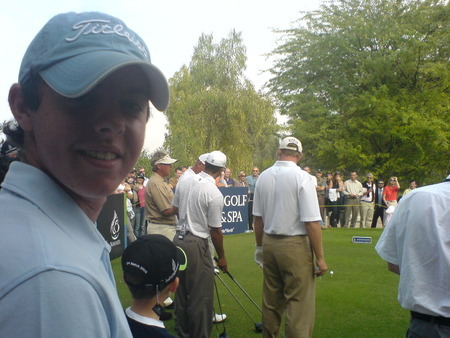 McIlroy watches Tiger Woods, Darren Clarke and Ernie Els play an exhibition in Dubai in 2006.McIlroy said: "This win has definitely moved me up a step and I just want to keep getting better and better. Your success only makes you more motivated to do better. "I have become a very good player, but I still have a lot of years to progress and I just want to keep improving and hopefully one day I will be able to compete with Tiger. "I will have to reassess my goals, but I will just go out every week and try and get myself into contention going into the back nine on Sunday and that's my goal every week." Ryder Cup skipper Colin Montgomerie described McIlroy as a "superstar in the making" but McIlroy is not looking too far ahead or taking his place on the 2010 Ryder Cup team for granted. He said: "Not quite. The campaign has not started yet. I think it starts in Switzerland again, so it's a place I like going to, and I just have to as I said, I just have to keep improving and playing golf and just put myself in a position to win. "If I'm able to do that, more weeks than not, then, you know, I'll obviously have a good chance of getting on the team." 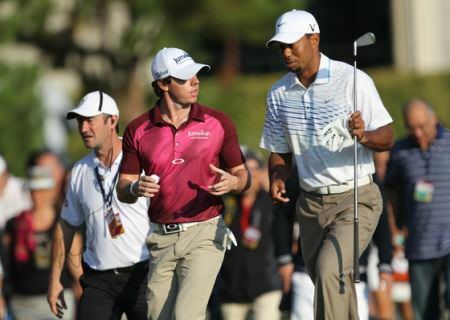 Rory McIlroy reckons he must become a ruthless finisher before he can be compared to top cat Tiger Woods. The Holywood teenager, 19, is the hottest ticket in golf after his breakthrough win in Dubai sent him soaring to 16th in the world. But after nearly blowing a six-shot lead in the desert he believes he has a long way to go before he can take on golf’s ultimate Terminator. Forced to drive from snowbound Heathrow to Manchester to catch the flight home to Belfast, McIlroy said: “There’s never been a better finisher in golf than Tiger. When you look at anyone coming down the back nine with a four or five stroke lead, you think it’s easy but it’s not. 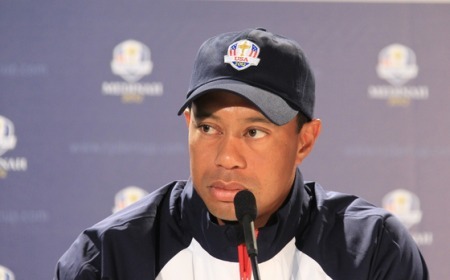 Tiger Woods speaking to the media in Medinah on Tuesday. Photo Eoin Clarke/www.golffile.ieTiger Woods reckons Rory McIlroy will be a marked man for Europe this week.